Dear devotee, your hands are very small, but with these little hands you are trying to serve me. Your eyes are very small, but my creation is enormous. With your two little eyes you are trying to see the whole vast universe. Your ears are very small, but with these two small ears you are trying to follow my words. With your two little feet you are attempting to come towards me. Merely serving me with your two little hands will not achieve very much. Merely looking at my vast world with your two little eyes will also not be of much use. Merely listening to my divine words through your two little ears will not get you very far, and merely coming into my presence with your two little feet will also not fully serve your purpose. But there is one thing that you can do, which will have a great impact, which will produce a truly significant effect; that is to install me permanently in your heart. Once you bring me into your heart, then those other activities will not seem very important. 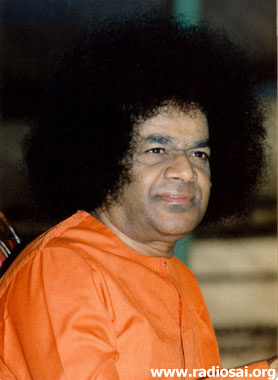 Whatever form of worship you engage in, using your eyes, your ears, your hands and your feet only serves to control the mind, but when you invite the Lord to enter your heart, then control of the mind and the senses becomes very easy. The mind and the senses will become still on their own. There will be no need for any special effort to be made in order to sacrifice the fruits of your actions. Lord Krishna said, "Once you start thinking and indulging only in thoughts of me, then all the rest will be taken care of by me automatically." To achieve this state you must develop a resolve and an unshakeable faith in the ever-present Lord residing in your own heart. Wake up my children! Wake up to the dawn of knowledge, wake up to your divine duties, wake up to your divine rights and wake up to your divine reality. Engage in action, but all the while remembering the Lord's name. You should always keep this goal before you and strive to attain it. Due to silent sitting an expansion of energy takes place within you. This is Man's electric power. The current of the human body is will power. You should be careful how you use this energy. By talking too much, you are wasting a lot of energy. This leads to a loss of memory power. Silent sitting does not mean merely keeping your mouths shut. You should exert control over your thoughts. The brain should get full rest. By rest, in this context, I mean a change of activity, for example, after studies you can engage yourself in manual labour or in singing bhajans. Whatever you study, study with full concentration. Above all, respect God, Who is your protector. The first and foremost duty of children is to make their parents happy. It is because of our parents and their sacrifices that we possess our bodies. Even after growing up, we should never forget our duty towards our parents. We should always be proud of our parents, and show respect and love towards them. If we love and respect our parents today, then we can expect the same treatment from our children tomorrow. God pervades the whole universe. Self-confidence is the foundation of life. To realize the core of divinity, expand your love. This has to be cultivated right from a tender age. If the sapling is straight, then the tree will grow straight. If human values are not developed in childhood, then that person will remain devoid of human values in adulthood. A child should be taught the 3Ds - Duty, Discipline and Devotion. Duty is God, Devotion and Discipline are the two bodyguards. Children are the makers of the future. If their life is good, then they will be good citizens of a good country. Ego comes due to ignorance. The causes of Ego are status, wealth, knowledge and material possessions; these come and go. Money comes and goes, but morality comes and grows. Fill your hearts with love, and then the whole world will be full of love. Where there is love there is happiness. If you commit a mistake due to ignorance, then resort to prayer. Prayer unites two people, Man and God, into one. Prayer elevates you and helps you to abandon the evil path. Inculcation of human values (love, peace, righteousness, truth and non-violence) is the true education. The hallmark of a true education is humility. Discipline your life by practicing the human values. Take to the good path. Try and guide those who have gone astray, lovingly, onto the correct path. First endeavour to improve yourselves in a systematic and humble way as charity begins at home. Light the lamp of knowledge within yourself. By transforming yourselves the effect will spread far and wide. Remember the minute that has fled is no longer yours; the minute that is approaching cannot be counted as yours; the minute that is with you, this alone is truly yours. Make the best use of it, for it may be your last. Joy and grief, heat and cold, are both in the plan of God, and yours is only to know this and to treat both as valuable. God draws the individual towards Himself; it is in the nature of both to have this affinity, for they are the same. They are like the iron and the magnet, but if the iron is rusty and covered with layers of dirt, the magnet is unable to attract it. Remove the rust, the impediment, that is all that you have to do. Shine forth in your real, natural form and the Lord will draw you into His bosom. Trial and tribulations are the means by which this cleansing is done. Sadhana (spiritual endeavour) is most essential, in order to control the mind and the desires after which it runs. If you find that you are unable to succeed, do not give up the sadhana but, rather, do it more vigorously. Sadhana means inner cleanliness as well as external cleanliness. You do not feel refreshed if you wear unwashed clothes after your bath, nor do you feel refreshed if you wear washed clothes but skip the bath. Both are needed. The Sadhana that you practise must make you a better, happier and a more useful person. It is your primary responsibility to demonstrate your calmness, humility, purity, virtue, courage and conviction under all circumstances. When suffering comes in waves, one after another, be glad that the shore is near. In both joy and grief remind yourself that they will not last long. God's grace is not given free. There are today two aspects relating to Man that have to be considered. One relates to a person's rights, the other relates to a person's duties. Most people are more concerned about their rights than their duties and engage themselves in various struggles to secure them. They are, however, not keen to recognize their duties. In all the different fields of human activity - social, political, economic and even spiritual - people do not recognize their responsibilities, their duties. They want high positions and high salaries, and they devote their entire lives to the pursuit of them. Rarely does a person stop to consider whether they are actually performing the necessary work to earn their salary, whether they are discharging their duties and responsibilities correctly. Such an attitude is prevalent not only in the workplace, but also in the spiritual field. Everyone says, "I want God, I want liberation, I want to ensure my well being both here and in the here-after", but are they making the necessary effort to achieve these desires. They say that they have no time for bhajans, that they are too busy to do any sadhana, that they have no time to think of God, and yet they still want God. To get anything you want from a shop, you have to pay the price, but Man today wants God in order to ensure his well being, but is he prepared to pay the price for getting Him? Is he prepared to offer to God the sacrifice he has to make to secure his well being in the here-after? Is he prepared to offer to God the love that has to be given to secure his peace, prosperity and security? Man today seeks to get something without paying the price for it, but the Lord cannot be deceived. He offers the appropriate reward for each action according to its nature - whether it is a gain or a loss, good or bad. We are entitled to expect what we desire from God only if we make the appropriate offering to God. Today no one is prepared to offer anything to God, but everyone is eager to get something from God. Unfortunately, today, because the parents themselves have no purity of character, are lacking in spiritual qualities and do not lead regulated lives, evil practices and wickedness are springing up all over the world. Because of the malefic effects of the Kali Age, parents tend to be quarrelsome and the children of today take after their parents. The tree is based on the seed and the seed determines the nature of the tree. For the evil ways and the bad behaviour of children today, the parents alone are to be blamed. Few parents choose to tell their children how important it is to speak the truth, to act righteously and to earn a good name and, as a result, many children today are a disgrace to their parents and to their country. For all the ills with which the nation is afflicted today, parents and teachers are responsible. Teachers do not punish the students for their lapses of behaviour, and because the students are not punished for their mistakes, they behave as they please. Teachers are responsible for the sins of their students. They do not teach the students the right path. They transmit only book knowledge, and do not teach right knowledge, wise living and higher values. If there are no morals and no human values, then Man becomes a demon. Parents are concerned solely about the material welfare of their children and have no concern for their spiritual well-being. It is not wealth that is important. Character is primary. Parents do not teach their children the importance of cultivating good qualities. They do not try to control their children when they go astray; rather, they condone the lapses of their children and often encourage them in their bad ways. It is because of such parents that many children today take to wrong courses of action. Parents today are afraid of correcting the mistakes of the children or of chastising them, but they have the right to warn and to correct their children. The most important thing in this world is the life of the spirit or atma. Mere bodily existence, mental life or intellectual life cannot be considered as living at all. The satisfaction that Man derives from time to time from these endeavours nearly always ends in disappointment. They are like the pursuit of a mirage. They do not serve to quench Man's thirst because they are not lasting. They come and go leaving a trail of misery. Who is a real conqueror in this world? Shankaracharya once said to his disciples, " Not the one who has subdued the world and brought it under his sway, not the one who has scaled the Himalayas and planted a flag on its summit, not the one who has crossed the oceans is a hero. You cannot look at conquests in such worldly terms. If viewed in this way even an animal can fight another and establish its victory. Likewise birds can cross oceans and can fly over the Himalayas. Where is the victory in all of these? Nowhere! Only the person who has subdued his mind is a real conqueror. It is a mental aberration to think that one has achieved a victory without subduing one's mind." All spiritual aspirants should cherish in their hearts with gratitude the good that is done to them by others and always remember the form in which help was rendered to them. Only those who lead such grateful lives will be able to find peace and happiness in their lives. Every person should therefore cherish the sense of gratitude. When wealth is lost nothing is lost, when health is lost something is lost, but when character is lost everything is lost. Human life is supremely precious in this world. But not all are aware of this truth. Wherein lies this preciousness? Humanness does not consist merely in the physical and the mundane. It is for the pursuit of righteousness that the physical body has been given to Man. God is the repository of Bliss. He is eternal. Humanness originates from Bliss and Bliss grows in Bliss and merges in Bliss. This Bliss is the goal of Man. Man is born in Bliss. To manifest Bliss is the duty of Man. This is the secret of the human saga. From infancy to old age Man dedicates every effort to secure Bliss, but this Bliss is not to be found in the places in which he searches. When he is the very embodiment of Bliss, to seek It outside of him is sheer folly. Does any Man search for himself outside of himself? If such a search is done, it is a sign of ignorance. Human existence is based on the Divine. Man is a spark of the Divine, and without the Divine, Man cannot experience Bliss. Consequently even though Man is the embodiment of Sat-Chit-Ananda, of Being-Awareness-Bliss, he desperately seeks Bliss elsewhere. The Upanishads have long exhorted Man to wake up from his sleep of ignorance and to realize his true nature. Man assumes that he is investigating various phenomena. This is not so. It is Man's senses that are experimenting with him. Man imagines that he is making use of his sense organs; not at all. The truth of the matter is that his senses are sporting with him, but Man is not aware of this fact. If Man had really mastered his senses and had full sway over them, he would not be subjected to anxiety. It is the senses that are holding sway over Man and are utilizing him for their own enjoyment. As a result Man has become a weakling. He is a victim of peacelessness and is prey to many troubles. It should be recognized that the senses are merely instruments. You should wield these instruments; you should not become their plaything. Unfortunately, because Man has become an instrument in the grip of his senses, he has become powerless to act properly. The slave of the senses is a fool. Only the one who subdues the senses is a hero. Anyone who misuses their senses is a fool, whatever the extent of their knowledge. It is essential to bring the senses under one's control, so that the senses will be powerless to cause any harm to Man. Many feel that it is human to err and that God should forgive their lapses whereas, in fact, if they are truly human, they should not commit mistakes at all. Even if sometimes a mistake is committed, wittingly or unwittingly, it should not be repeated. It is a grievous error to think that it is natural for a human being to err. Such a feeling should not be entertained at all by anyone. Every man should realize, " I am not weak, I am not an animal. I am not a demon, I am a man ". When a man has this conviction he will not commit mistakes. Man is the very embodiment of the spirit or Atma and the Atma cannot be affected by any taint. It is the attachment to the body, which is the cause of bad thoughts, bad desires and bad actions. It is the one who is a slave to his senses that is a prey to such impulses. To follow the directive of the senses is a mark of the animal. To be guided by the Atma is the real sign of the human. No one should attempt to justify his weaknesses and lapses as being natural to a human being. They should be regarded as signs of mental debility. You should continually strive to master your senses. When you have truly acquired sense-control, you will experience the power of the Divine within you. Right is right even if nobody does it, wrong is wrong even if everybody does it. If people do not love you, be sure, that it is your fault. It is disgruntled people that find fault with the world. It is those who have no peace in their hearts that cause disturbances in the world. They are restless, so they, in turn, engender restlessness in others, and then think that it is a rotten world. You should know what to do; have the right knowledge, the right judgement and the right action. If you want to see the whole world coloured green, then you should not try to paint everything green, you should simply wear green tinted glasses. Many people declare, "I am an individualised soul, I am a spark of consciousness, I am an embodied spirit", but declarations such as these do not reveal a true understanding of the life principle. The individualised soul is Divine Consciousness, installed in a chariot, the body. It is not a bundle of inert stuff, moulded into a form and labelled with a name. There is only one all-pervading Consciousness, but Man experiences It in fragments and, mistaking It as many, he gropes around in the confusion caused by his own ignorance. Many scripture have instructed Man of the truth that God dwells in his body along with the ego, with God inducing him to aspire for the heights, and the ego advising him to be content with the low. The ego has faith in the reality of the world and of itself. The Divine Principle, on the other hand, asserts that It is ever present, both close to Man as well as far from him. The fact is that people only feel that God is far away, because they are not aware of God being near them, nay in their own hearts. The truth that the scripture teach is that God is everywhere, both near and far, both above and below, both inside and outside. God is one, Indivisible and Omnipresent. "The study of sacred books and listening to religious discourses is meant to develop self-control and peace. I am not for indiscriminate reading of books however valuable they may be. Much reading tends to confuse the mind. It fosters argumentation and intellectual pride. What I insist upon is putting the things read into practice, if not all, a least a thing or two. Moreover, remember that a book is only a pointer, a guide, a signpost. Reading alone cannot be the completion of the journey. It is only the first step; read for the sake of practising, not for reading's sake. Too many books in a room indicates that a person is suffering from intellectual illnesses, just as too many tins, capsules and bottles of medicines in a cupboard indicate that the person is suffering from physical illness."